With this sweltering heat, Californians have cold foods on the mind. The importance of local ice cream vendors has never been greater, but for those who are too damn hot to venture out, what better time to splurge on a New York treat? il Laboratorio del Gelato ships nationwide, and their ricotta, hazelnut and green apple flavors refresh particularly well. But this indulgence is only for those who don’t mind spending a pretty penny on their gelato -- four 18-ounce containers packed with the flavors of your choice will cost about a hundred bucks total. Available for online purchase at il Laboratorio del Gelato. Organic, Fair Trade, and micro-roasted coffees are taking the caffeinated world by storm -- and finally getting their due in the press. Though Victrola Coffee & Art remains somewhat under the radar, it’s among the best, and if you’re in Seattle, experiencing fresh brews at their fab retro café is a must. But, there’s no need to remain an armchair coffee tourist. You can order online from Victrola, as well as from the nation’s most skilled roasters. For great virtual coffee tourism, check out Gimme! Coffee, Intelligentsia, La Colombe Torrefaction, and Groundwork Coffee Company. Victrola's Streamline Espresso (pictured here) will set you back $13 per pound. In her latest newsletter, Nina Planck, founder of the Real Food Markets, provides a lesson in evolution: if you're wondering why berries only come in bright shades of red, blue, and purple, it's "because they have to be visible to your Stone Age brain, to pop out of all that blurry green foliage somehow, or else you wouldn't stop to pick them, eat them, and spread their little raspberry and strawberry seeds all over tarnation." Color: A procreation strategy for the berries and an indicator of antioxidants for us. NYC Nosh talks about the mangosteen, a fruit that is illegal to import fresh into the United States for fear of foreign pests, describing it as tasting "a bit like a tangy peach, but with the texture of a ripe cherry." Chefs from The Core Club, a Midtown-East private club, buying baskets of peaches at Terhune Orchards and bags of various onions at Paffenroth Gardens...Chefs from Whole Foods trying French arugula at HydroGarden Farm, both on Wednesday, July 26th at the Union Square Greenmarket. Donut peaches ($3.50/lb., $5/quart) from Phillips Farms and Red Jacket Orchards..."super sweet" corn (3/$1) from Paffenroth Gardens, as well as a matching decrease in price for the bi-color corn at Migliorelli Farm...organic heirloom tomatoes from HydroGarden Farms...mixed heirloom and gourmet tomatoes ($3/pint) from Oak Grove Plantation, including yellow plum, green grape, rose quartz, sun gold, garden peach, and Matt's wild cherry varieties...low acid tomatoes ($2.50/lb.) from Kernan Farms..."revolutionary" red watermelon ($1/lb.) from Oak Grove Plantation...shiro and early wizard plums ($3/lb.) from Locust Grove...squash blossoms are abundant (see FOCUS ON)...hot Portugal peppers ($0.25/ea.) at Keith's Farm. Peppers at Oak Grove Plantation: pepper plants ($8.75) as well as a half dozen other varieties ($3-$4/lb) with advisories on spiciness, ranging from the "mild to medium hot" jalapeño to the "extremely hot" serrano. Tompkins Square Park, in the middle of East Village, hosts this Sunday Greenmarket in its southwest corner. Some of the same farms that sell at Union Square appear here: DiPaola Turkey Farms, Sprout Creek Farm, Conuco Farm, and Fantasy Fruit Farm all have stands. There are many other farmers who do not sell at Union Square or even elsewhere in New York. There is more of a focus on organic food at this market, with many farmers selling certified organic produce. Lots of vendors offer samples and live music often plays in the park during the market. 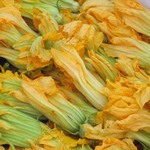 FOCUS ON: Squash Blossoms (Yuno's Farm, 4/$1; Locust Grove, $3/quart; Evolutionary Organics, $5/box; Windfall Farms, $5/box). Squash blossoms, also known as zucchini blossoms or zucchini flowers, are currently in their peak season, available from several farms selling across the city. These bright orange blossoms are delicate: hold them under a light stream of running water to clean. Dry with a paper towel and store in an air-tight plastic container in the refrigerator. Squash blossoms have to be used within a couple days of being picked or they will go bad. Squash blossoms have much of the same nutritional punch as their sister plants summer squash and zucchini: all are filled with vitamins A and C, potassium, and calcium. Find them in New York...fried with mozzarella cheese at Gusto...stuffed with cheese, battered with panko bread crumbs, and fried at Oceana...made raw-vegan at The Plant, stuffed with "ricotta" (actually, a puree of almonds, cashews, pine nuts, and garlic scapes). Make them yourself...Locust Grove recommends sautéing, stuffing or throwing them in a salad...Yuno's recommends stuffing them with ricotta or mozzarella, dipping them in egg batter with flour or corn meal and frying...Evolutionary Organics recommends stuffing them with cheese and herbs and sautéing, battering and frying, or putting them on pizzas or in omelettes...Windfall Farms has a handout at the Union Square Greenmarket with recipes for battered squash blossoms and squash blossom quesadillas (a similar recipe for squash blossom quesadillas can be found at The Food Network). DiPaola Turkey Farm, Hamilton Square, NJ. At the Union Square Greenmarket Wednesdays, Fridays, and Saturdays, and at the Tompkins Square Greenmarket Sundays (609.587.9311). Evolutionary Organics, New Paltz, NY. At the Tompkins Square Park Market Sundays (845.256.1355). Kernan Farms, Bridgeton, NJ. At Union Square Greenmarket Wednesdays. Red Jacket Orchards, Geneva, NY. At the Union Square Greenmarket Mondays, Wednesdays, Fridays, and Saturdays (800.828.9410). Windfall Farms, Montgomery, NY. At the Union Square Greenmarket Wednesdays and Saturdays. Yuno's Farm, Bordentown, NY. At the Union Square Greenmarket Mondays and Fridays. Calling all desk-bound chocophiles! Here's a Desk Organizer you can appreciate. Not only does it store your pens and paper with flair, it's even chocolate-scented. The only downside is that you might attract unwelcome officemates sniffing around your desk for sweets. $14 at Fred Flare. 1. Cheese and Wine at Telepan, Join Waldemar and Nadia, Fromagers at Artisanal Bistro and Fromagerie, for an afternoon of wine and cheese tasting. The two will introduce the cheeses paired with wines off Telepan's list, Saturday, July 29th, 12:30 p.m. to 2:00 p.m., at Telepan, 72 West 69 Street. $65/person (212.580.4300). 2. Local Honey from Local Bees: How Much Better Is It?, Bill Mares will discuss his new book, Bees Besieged, which explores the role bees play in the lives of human through agriculture and food production. A tasting of honeys from three local producers will follow, Saturday, July 29th, 1:00 p.m. to 4:00 p.m., at Stone Barns Center for Food and Agriculture, 630 Bedford Road, Pocantico Hills. $25/person (914.366.6200). 3. Cracking the Coconut, Myra Kornfeld, chef at Angelica Kitchen and author of The Voluptuous Vegan and The Healthy Hedonist, will teach this hands-on cooking class focusing on the variety of uses and nutritional benefits of the coconut, Saturday, July 29th, 1:00 p.m. to 4:30 p.m., at The Natural Gourmet Institute, 48 West 21st Street. $85/person (212.645.5170). 4. Okra, Beans, & Leafy Greens: The African American Foodways Festival, Phillipsburg Manor and Stone Barns Center for Food and Agriculture will jointly host this festival to explore the influence of African migration on colonial and current American cuisine, Sunday, July 30th, 10:00 a.m. to 5:00 p.m., at Phillipsburg Manor, 381 North Broadway (Route 9), Sleepy Hollow and at Stone Barns, 630 Bedford Road, Pocantico Hills (free shuttles run between). $12/person (914.631.8200). 5. Greatest New York Chefs: Alex Ureña, The James Beard Foundation will host this seven-course dinner to showcase and celebrate the career of Alex Ureña, a chef who worked at Bouley and Blue Hill before opening his eponymous restaurant in January of 2006, Tuesday, August 1st, 7:00 p.m., at The Beard House, 167 West 12th Street. $100/person for members, $130/person for guests (212.627.2308). 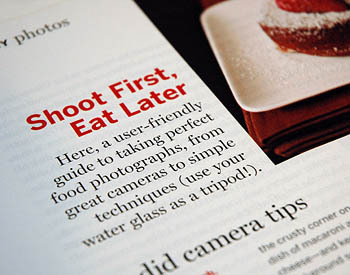 The August issue of Food & Wine magazine includes an article on food photography featuring several "Best-Shot Blogs," including Chez Pim, She Who Eats, 101 Cookbooks, and The Food Section (by the way, the blood orange photos mentioned in the article can be found here). My top photography recommendation is to use available light whenever you can. If conditions are so dark that you'll risk blurring the shot by shaking your camera, try using a mini-tripod. There are quite a number of models on the market (I happen to own this and this), but I've also seen two more that are particularly novel: The Gorillapod has flexible legs, so you can attach it just about anywhere (even hanging upside down), and Bogen's Pod, essentially a beanbag, helps to stabilize almost any surface. If you must resort to using flash, I prefer to bounce the flash off the ceiling, but this will only be an option if you have an external flash. And then there's always the water glass-as-tripod technique mentioned in the article, which really does work (see the photos here for evidence). However (and this should seem obvious), don't do it with a digital SLR, or your camera might end up smack dab in the middle of your clafoutis. On the other hand, using a glass will help you steady one of the smaller, lightweight digital cameras when you're shooting at a slow shutter speed. But, only use the glass to help keep your camera steady -- don't let go! For more on the subject of food photography, be sure to visit 101 Cookbooks, where Heidi Swanson has put together a post with additional tips for improving your food photos. For some examples of truly awe-inspiring food shots, you can do no better than Keiko's stunning blog nordljus. No, this is not a giant aspirator (though it does look like one, to my mind). The ingeniuous Squeeze-Me handheld juicer allows you to squeeze, strain, and store fresh lemon without getting your hands dirty. Just drop half a lemon into the base, attach the top, and squeeze away. $27 at Generate.